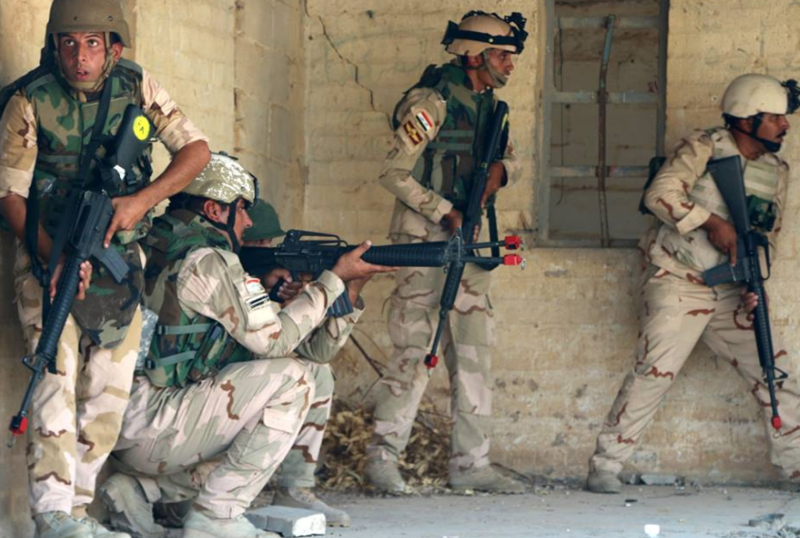 Iraqi Troops in Training by Task Group Taji (U.S.). Photo by OIR August 2016. SOF News Update 20170628 – Polish JW Grom, Green Beret innocent in ‘home intruder’ case, Navy SEAL fitness, native of Cameroon now member of 1st SOAMDS, Leahy law and FID, US SOF raids in Syria yield intel, Det A in Berlin during Cold War, H145M helos for German KSK, NFL Coach visits 7th SFG, another Nick Turse article on SOF, and more. Polish JW Grom. Rich Reynolds writes an article about Poland’s Jednostka Wojskowa Grom. The JW Grom is Poland’s elite counter terrorism unit and is one of the five special operations units (SOF) of the Polish military. The Grom was established in June 1990. Reyolds’s article provides information on the past commanders, organization, training, and known operations of the JW Grom in “Special Forces in Focus: Poland’s JW Grom”, The Baltic Post, June 25, 2017. Leahy Law. The Leahy Law is intended to restrict security assistance to foreign military or police units that may have been associated with violation of human rights. Many Special Forces Soldiers looked upon the Leahy Law as a hindrance to working with security forces in South America, Africa, the Middle East and elsewhere. Learn more in an article published on June 27, 2017 by Just Security. H145M Multirole Chopper to German KSK. The Kommando Spezialkrafte is now using the H145M helicopter made by Airbus Helicopters. The 15th and final chopper was delivered in June. Read “Airbus completes H145M deliveries to German special forces“, Janes, June 26, 2017. Cameroon Native Member of 1st SOAMDS. A Captain serving as a public health flight commander in the 1st Special Operations Aerospace Medical Squadron at Hurlburt Field hails from the African nation of Cameroon. Read “Face of Defense: Persistence Makes Air Commando’s Dream a Reality”, DoD, June 27, 2017. Jaguars Coach visits 7th SFGA. Coach Doug Marrone is the new head coach of the Jacksonville Jaguars. He spent a day visiting Soldiers from the 7th Special Forces Group to talk about leadership and challenges. Read more in “NFL Coach Pays Visit to 7th SFG”, NWF Daily News, June 26, 2017. Weaving Fact with Fiction. Nick Turse, a self-proclaimed SOF expert, provides his version of how U.S. special operations forces are employed through the world. Once again, he provides enough facts in his article to make the read interesting while at the same time injecting his version of the story. Read “A Wide World of Winless War: Globe-trotting U.S. special ops forces already deployed to 137 nations in 2017“, The Huffington Post, June 25, 2017. Det A of Berlin. During the Cold War – when the threat of a Soviet Bloc invasion of western Europe was deemed by some as very high – a secret and small Special Forces unit trained for and conducted very dangerous missions behind the ‘Iron Curtain’. Detachment A based in the East German city of Berlin was where they practiced their craft. Read more in a news report by Drew Brooks in “A Clandestine Cold War Military Unit Steps Into the Light”, Task & Purpose, June 26, 2017. Want to Look Like a Navy SEAL? If you want to be in great shape then you should consider a physical training program similar to what the Navy SEALs use. Read “How To Get in Shape Like a Navy SEAL”, by James Clark, Task and Purpose, January 2016. U.S. SOF Raids Provide Intelligence. U.S. special operations forces have been conducting commando raids on a regular basis to develop the intelligence picture of the Islamic State. Read more in “Commando Raids on ISIS Yield Vital Data in Shadowy War”, by Eric Schmitt, The New York Times, June 25, 2017. Green Beret Innocent. A Special Forces Soldier, formerly of 10th SFGA, has been found innocent in a ‘home intruder’ court case. Read more in “Jury Finds Former Green Beret Innocent in 2015 Shooting of Home Intruder”, Task and Purpose, June 27, 2017. Top photo: Iraqi troops training in August 2016. Credit to CJTF-OIR.